I have another entry titled Dystopia, and thought about including Alfonso Cuarón's Gravity and J.C. Chandor's All Is Lost there with the argument that man has now littered the galaxy/ocean with so much garbage (satellites and space junk/shipping containers and Chinese-made sneakers) that we have turned the serene beauty of space/the sea into dangerous, dystopian environments for astronauts/seamen already threatened by an indifferent universe. Since seeing Gravity, I have started every conversation about it by paraphrasing an astute observation A.O. Scott makes in his excellent review of the film. 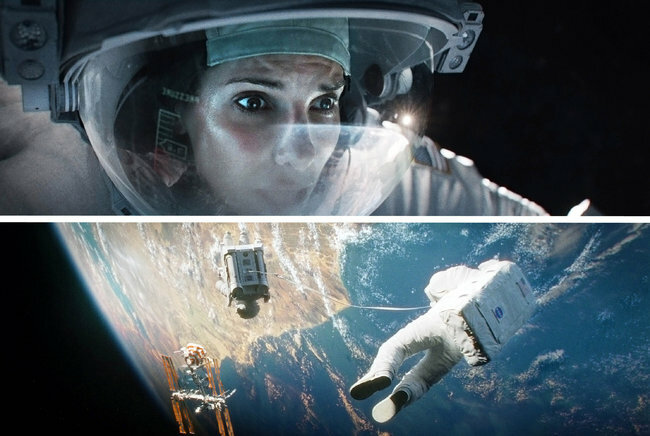 "Gravity," says Scott, "is less a science-fiction spectacle than a Jack London tale in orbit. .... [T]here is a swift and buoyant story of the struggle for survival in terrible, rapidly changing circumstances. Cosmic questions about our place in the universe are not so much avoided as subordinated to more pressing practical concerns." Mission Specialist Ryan Stone and Mission Commander Matt Kowalski (Sandra Bullock and George Clooney) have piloted space shuttle Explorer to service the Hubble telescope. Houston warns that a Russian missile has accidentally struck a communications satellite, sending debris their way. They have little time before it is hurtling at them, cuts their communication with Houston, and then their tether to each other. To make matters worse, the initial explosion has created a domino effect, with waves of debris coming at regular intervals. Early on, the story becomes Stone's and her fight for survival. Scott says that "The defiance of impossibility is this movie's reason for being." Well, it might be possible to overcome the impossible in Gravity, but it is not at all probable, and therein lies one of the film's weaknesses. Gravity is a highly improbable, thin tale, and one unworthy of London, whose stories are meticulously crafted. Its raison d'etre is visual dexterity and ingenuity; it's certainly not acting. I admit it is all quite lovely, but after 30 minutes I had gotten the picture, so to speak. The film is an encyclopedia of special effects techniques from analog to digital with CGI and 3D and everything in between. I am sure Emmanuel Lubezki will be nominated for Best Cinematography, though he has a veritable host of people who collaborated with him, from an art department of almost 50, to 22 special effects, 470 visual effects, and 58 camera and electrical people, to 38 animators. It is ALL about the visual effects. All Is Lost, on the other hand, is brilliant. Robert Redford's performance is a tour de force. Frank G. DeMarco's and Peter Zuccarini's cinematography is breathtaking. Alex Ebert's score is transcendent. This is Jack London transported from the Yukon to the open sea, where the unnamed man must draw from untapped reserves to survive the wilderness. He is an existential character fighting the elements alone. There is no God to pray to in London's world, and Our Man in All Is Lost gives in only once to a single primal scream. Redford's performance is a hallmark of what it means to be an actor. He is in almost every frame and gives his silent protagonist a complex inner life without saying anything at all. Chandor and Redford have done something remarkable in All Is Lost: they have told a deeply existential story. In a 1946 lecture, Jean-Paul Sartre used the phrase "existence precedes essence," a distillation of the ideas proposed by Martin Heidegger and Søren Kierkegaard. Our Man embodies this precept of being as the source of meaning in a meaningless world of indifferent nature. This reality leads Albert Camus, in The Myth of Sisyphus, to conclude that "there is only one truly serious philosophical problem, and that is suicide." In the face of indifferent nature, why don't we just shoot ourselves? We chose not to. Instead, every action we take is a choice to give our lives meaning in the face of nothingness. Our Man is resolved to survive, and his final action is an exposition of the freedom that is just another word for nothing left to lose. For all their parallels, Gravity stars big names with pretty faces; All Is Lost stages a noble performance by a great, mature actor. Gravity is special effects and 3D; All Is Lost is aesthetically stunning cinematography. Gravity is Hollywood conceit; All Is Lost is an exploration of the truths of the human condition.